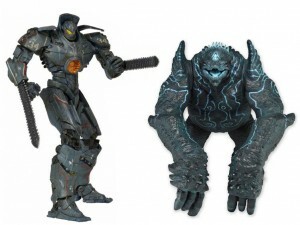 If you missed out on the first round of NECA’s Pacific Rim Leatherback and/or the battle-damaged Gipsy Danger, here’s your chance to get both for just $34.99. Delivery has been confirmed for mid-March on the upcoming reissue of the MP-12 Sideswipe! Our supplier has confirmed that the quality control issues found in the initial release should be resolved for this reissue. Preorders are open now at $79.99. Sideshow is also creating an Iron Patriot 1/4 scale statue. This piece is listed at $379.99 and includes light-up eyes, arc reactor and hand repulsors and a switch-out Don Cheadle head sculpt. Asmus Toys’ new Gandalf figure comes with his sword Glamdring (and sheath), his staff, an orc head, alternate hands, a full cloth outfit and more. It is listed at $169.99. The new Lara Croft Survivor statue is done in 1/4 scale and shows her holding a bow and gripping her wounded arm. It is limited to 1000 pieces and is listed at $299.99, saving you $70 off of the MSRP. This statue stands 16.25″ tall and shows Merle after his killing by the Governor and subsequent rise as a zombie. He is priced at $359.99, saving you $40 off the MSRP. With a design taken from CGI information used in the movie, this Iron Patriot statue is as screen accurate as possible. It stands 19.25″ tall and has multiple points of illumination; we have it listed at $359.99, $40 off the MSRP. This 1/100 scale kit will stand about 8.25″ tall when completed and also includes 1/100 scale figures of Solid/Old Snake, Liquid Ocelot and 3 types of Heaven Soldiers. We have it listed at $99.99. Leia appears in her Hoth outfit in the latest 12″ Jumbo figure from Gentle Giant. She comes with her blaster and is listed at $71.99, $8 off the MSRP. Han is shown in his Stormtrooper disguise in this new piece. He comes with two heads (Han and Stormtrooper) and two sets of arms, and is listed at $238.99, $26 off the MSRP. Bandai America has announced a line of figures to go with the upcoming Godzilla movie. We have Chibi figures, Destruction packs, Godzilla Fighting Figures and a Godzilla Deluxe Attack and Roar figure. You can see more information and pricing for all of these new listings at the link. The first of two new Megazord listings is the Legendary Megazord. It is comprised of the Skyship, the Racer, the Sub, the Truck and the Jet, and is listed at $34.99. The new version of the Wild Force Red Lion has a firing missile and can combine with other zords in a variety of ways due to it’s assembly options. It is listed at $24.99. Rocky Balboa is immortalized for your collection in the form of this 15″ statue from Schomberg Studios. It is sculpted by the man who created the original, which sits outside the Philadelphia Museum of Art, and is styled after that piece; we have the Resin version listed at $124.99 and the Pewter version at $249.99. Avarkus the Red Death stands 21.5″ tall and wears a rich cloak with a gold mask on a stem in his hand. This horrific statue is listed at $379.99. This new set includes three new zombie sculpts in two different colors each, as well as a new Daryl Dixon sculpt to fight them off. It also includes multiple chain attachments and other pieces to make your own Woodbury Arena, and is listed at $19.99, $2 off the MSRP. Levi from Attack on Titan is the next Figma figure to be released from the popular manga story. He comes loaded with twin swords and other equipment, and is listed at $59.99. 4800+ Items On Sale! 1500 Items at 40% Off or More! The second figure release in the Feral Rex line is Fortis, who changes from rhinoceros robot, and also will become a leg of the combiner figure. Like Bovis he comes with a giant cannon that becomes a foot, along with other weapons, and is listed at $104.99. The fifth and final figure needed to complete the Unique Toys War Lord is now in stock at $109.99. This figure comes in a very large and nicely designed box and includes the huge wing piece and more. This new figure is loaded with accessories such as the Morph Ball, alternate hands, beam effects, a display stand and a missile-shooting pose part. This piece is listed at $49.99, $5 off the MSRP. This statue shows Samus in her metallic blue Zero suit, complete with a Metroid floating behind her. This piece is listed at $99.99, saving you $15 off of the MSRP. This popular two-pack is created from ILM’s digital files. We have it priced at $34.99, saving you $8 off the MSRP. Kathy Kane stands 9.6″ tall on her base and is shown in her black and red outfit with a grappling gun in her hand. This statue is listed at $84.99, saving you $15 off of the MSRP. Enterbay’s new T-800 figure features an LED-lit eyeball, interchangeable parts, multiple weapons and much more. It is priced at $419.99, saving you $80 off of the MSRP. From “Thor: The Dark World” comes this figure of Natalie Portman as Jane Foster. The figure comes with a base that can combine with Thor’s base and is listed at $21.99, $3 off the MSRP. The newest Minimates box set focuses on the new iteration of the Thunderbolts, and includes Deadpool, Elektra, the Punisher and Red Hulk. It is listed at $17.99, $2 off the MSRP. This second part of the trio has finally arrived. It is listed at $536.99. Bowen Designs’ latest Marvel statue is Rogue in her current costumu, as seen in Uncanny Avengers and other titles. She is sculpted ‘hovering’ with a translucent trail/base, and is listed at $229.99. This new Dressed Tonner Character Figure shows Supergirl in her New 52 outfit. She is priced at $199.99.